The Cash Plus Standard cash drawer provides unparallel quality and flexibility ensuring suitability for any retail or hospitality environment. 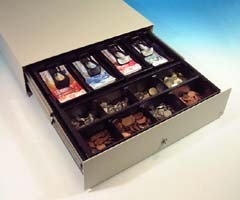 Manufactured with a robust steel construction the Cash Plus Standard provides a compact design but with high capacity storage and flexible insert design. 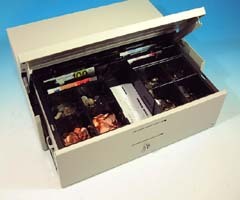 The Cash Bases Cash Plus Flip Lid cash drawer is industry acclaimed as being "best of breed" for many retailers. W460mm x D172mm x H100mm. W490mm x D172mm x H110mm. . 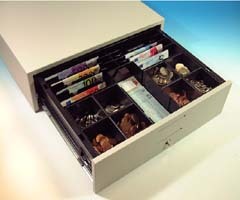 The Cash Bases SL3000 Cost Plus Slimline cash drawer is competitively priced to meet a wide range of generic standard PC, EPoS terminal or cash register requirements. Manufactured with steel ball bearings and a new latching mechanism, the SL3000 has been designed to meet the most hostile of retail or hospitality environments. Dimensions W446mm x D410mm x H107mm.